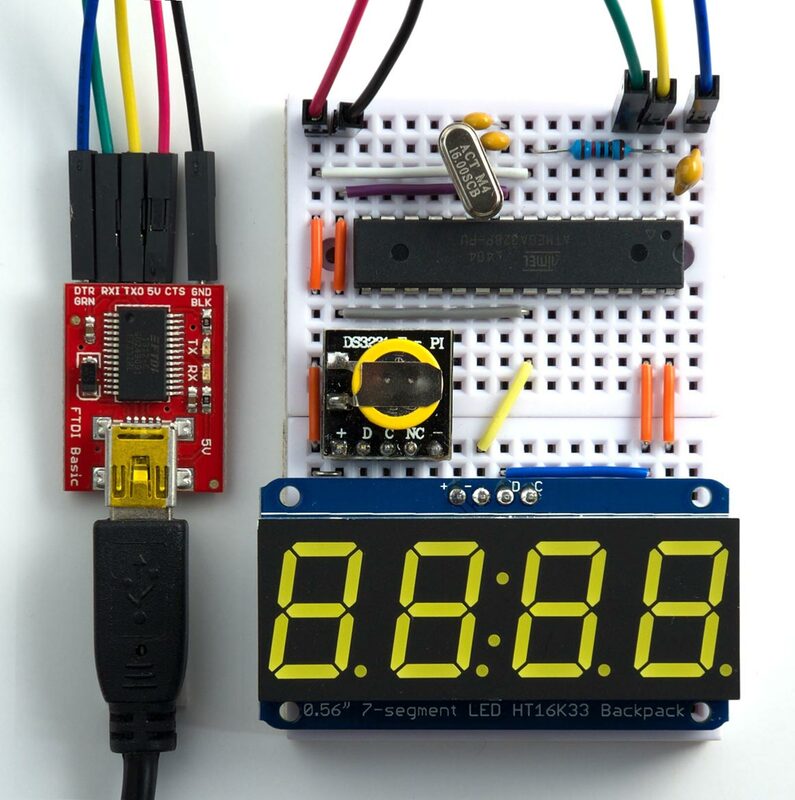 Clock based on an ATmega328, I2C display, and RTC module, programmed in uLisp. Circuit for the clock programmed in uLisp. The processor is an ATmega328P running at 16 MHz, with a 16 MHz crystal to generate the clock. The processor clock isn't used for timekeeping, so a ceramic resonator would probably be adequate. 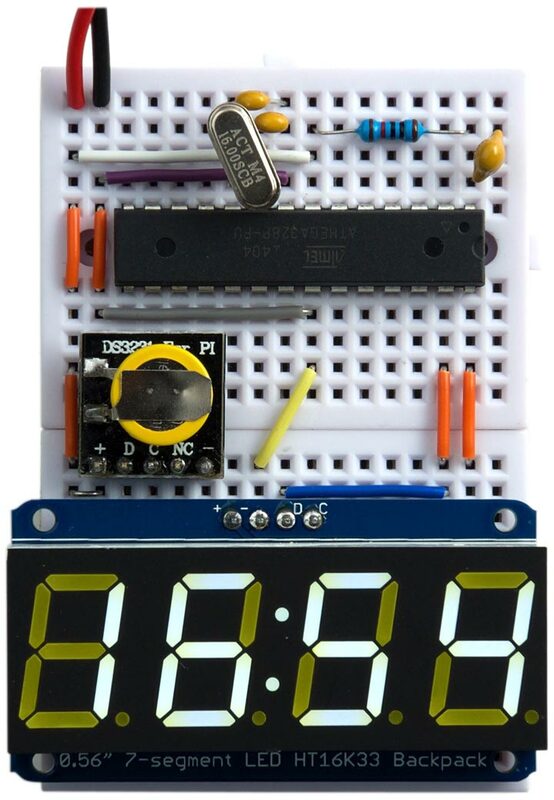 The timekeeping is provided by an DS3231 RTC module , which is a low-cost, extremely accurate I2C real-time clock with an integrated temperature-compensated crystal oscillator. Boards are available from several suppliers; I used one incorporating a backup battery from Seeed Studio , available from The Pi Hut in the UK . I swapped the header socket for a row of header pins to make it easier to fit it into the breadboard. For the display I used an I2C 7-segment display from Adafruit , available from Proto-Pic in the UK . I chose a white display, but it's available in a range of other colours. The modules connect to the ATmega328 using four wires: Data to SDA (pin 27), Clock to SCL (pin 28), VCC, and GND. I used the default I2C address for each device; #x70 for the RTC, and #x68 for the display. I built the circuit on a pair of mini breadboards, available from SparkFun  or HobbyTronics in the UK . I powered the clock from a 3.7V LIPO cell. Unless you bought an ATmega328 chip with a bootloader already installed, you'll first need to upload a bootloader using In-System Programming (ISP). I used Sparkfun's Tiny AVR Programmer, as described in ATtiny-Based Beginner's Kit. Connect the Tiny AVR Programmer to the SCK, MISO, MOSI, RESET, VCC, and GND pins on the ATmega328, select Arduino/Genuino Uno on the Board submenu, and choose Burn Bootloader from the Arduino IDE Tools menu. Connecting the clock to the Arduino IDE via an FTDI USB-to-serial converter. The first step is to install the uLisp interpreter. Get the latest version from the Download uLisp page, and upload it to the ATmega328 from the Arduino IDE. From now on you can program the clock in Lisp using the Serial Monitor in the Arduino IDE; for more information see Using uLisp. The last write-byte sets the brightness, which can be from #xe0 (off) to #xef (maximum). For each display digit you have to write two bytes to the display; this is for compatibility with Adafruit's other displays, and for this display the second byte is always zero. Curiously, there are effectively five digits, with the colon counted as the third digit, and to light it you have to write the value 2. You now have a stand-alone digital clock programmed in Lisp! The DS3231 RTC includes the date, and two alarms, and the uLisp program could easily be extended to interface with these. However, the above clock program only just fits in the 2 Kbytes of RAM available in the ATmega328, so you would need a processor with more RAM. Unfortunately Atmel don't make another processor in the ATmega328 series (an “ATmega648” would be nice with 4 Kbytes of RAM). However, the ATmega644 and ATmega1284 provide 4 Kbytes and 16 Kbytes of RAM respectively, and they're available in PDIP packages, so either of these would be suitable. I hope to write about using these in a future article. ^ DS3231 Datasheet on Maxim Integrated. ^ Mini RTC Module on Seeed Studio. ^ Mini RTC Module for Raspberry Pi on The Pi Hut. 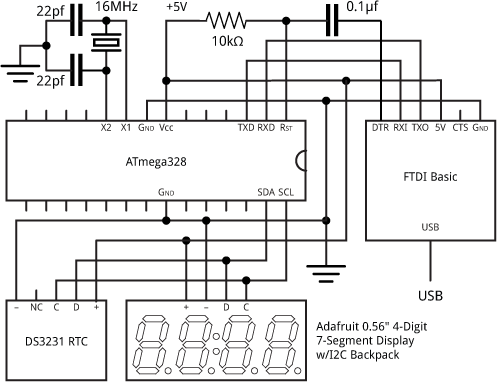 ^ Adafruit 0.56" 4-Digit 7-Segment Display w/I2C Backpack on Adafruit. ^ Adafruit 0.56" 4-Digit 7-Segment Display w/I2C Backpack on Proto-Pic. ^ FTDI Basic Breakout on Sparkfun. ^ FTDI Basic Breakout on HobbyTronics.